Home decorating giveaway 5 Laundry Room Tips & Tricks AND a $500 Home Depot Gift Card Giveaway!! 5 Laundry Room Tips & Tricks AND a $500 Home Depot Gift Card Giveaway!! Last year I gave my laundry room a much needed facelift. After all, when you're going to spend as much time in a space as most of us do in our laundry room...shouldn't that space be nice to look at? ...and added a hanging rod to the shelving above the washer and dryer so that I can have a place to hang-dry clothing. 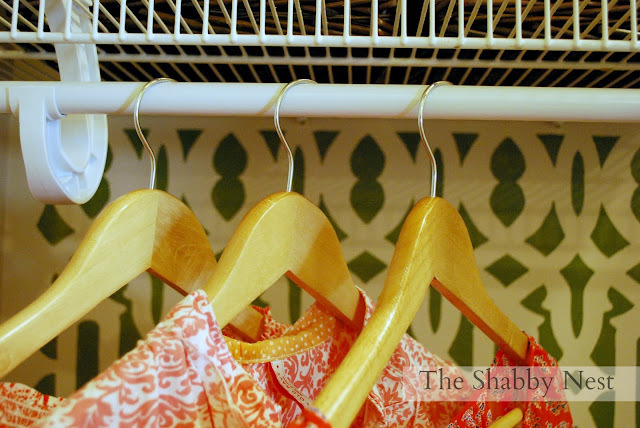 That simple addition makes a world of difference, so today I thought I'd share some of my favorite tips and tricks for making your laundry room both fun and functional. 1. Add some color. 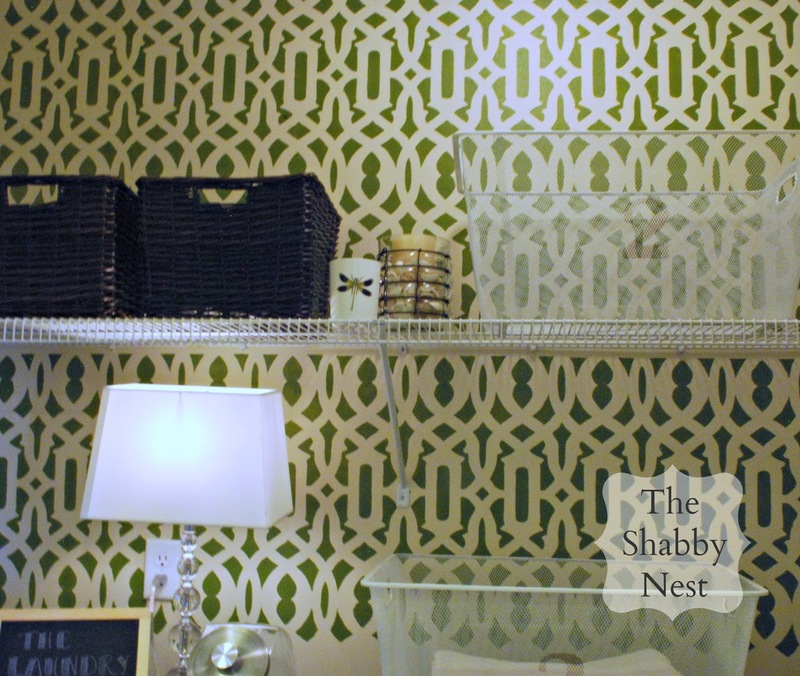 When I made over my laundry room last year, I used a stencil and fabulous green paint to give the boring wall some interest. 2. Create a functional workspace. I purchased a pre-made countertop to place on the washer and dryer so that I have plenty of space to fold clothes. 3. Add lots of storage. Laundry rooms are often used to store cleaning supplies as well as clothes. Choose pretty baskets to create chic storage for both. 4. Add art to make the space your own. My no-smudge chalkboard art is cute and adds personality. 5. Don't be afraid to revisit the space later and add extras you might need. My new hanging rack is the perfect example. If you're looking to add some fun and functionality to your laundry room, you're in luck. 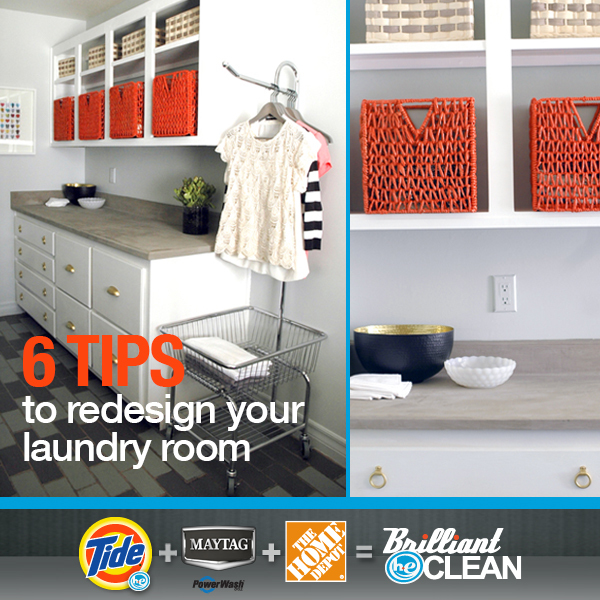 The Home Depot, Maytag and Tide have all teamed up for the #BrilliantHEClean campaign. They're giving away a new Maytag washer & dryer, a year's supply of Tide, a design consultation with Jenny from The Little Green Notebook AND $5000 to make your laundry room beautiful! To enter for your chance to win, go to this site. And today, one lucky reader of The Shabby Nest will have the chance to win a $500 Home Depot Gift Card and some samples of Tide! To enter just leave a comment on this post telling me what you'd like to do to spruce up your laundry room! A winner will be chosen at random from all entries received by Saturday, August 10 at 11:59 pm MST. 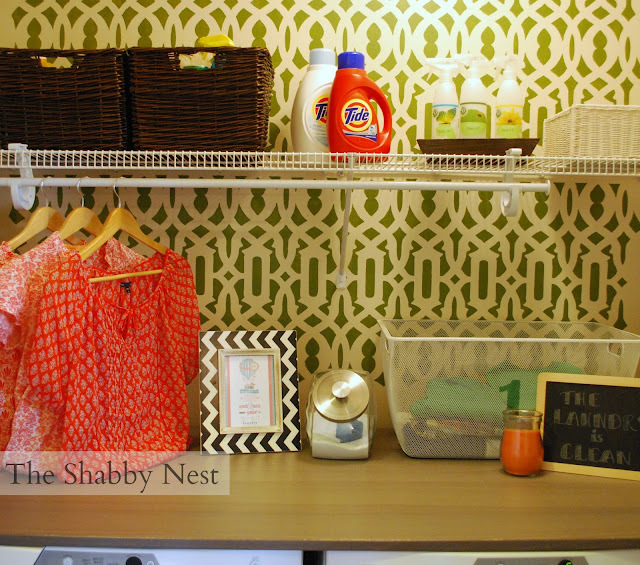 If you want more laundry room design tips, check out Jenny's ideas here. This post was sponsored by The Home Depot and P&G. The opinions expressed are 100% mine. I love the wall paper! And the counter top over the washer/dryer is a great idea! I would love to make my laundry room more colorful since I spend so much time in there. I would like some shelves for storage and a table for folding laundry. I really do not have a "laundry room" It is junk, washer and dryer, and food storage room! If I won this I would make it an official Laundry room! Did you stencil that whole room? Amazing! It looks great! I'd love to have a place to fold clothes in my laundry room! I would start by painting the walls. Then add a rolling cart between the washer and dryer with pretty jars to hold detergents and soaps, a new shelf above, a brightly colored rug and a spruced up garbage can...Now I want to get to work! Where do I start. First of all I would repair the wall behind my washer and dryer where we had a water leak. I'd like to put in new shelving or some type of cabinet. I need to re-work an area for hanging and folding clothes. Honestly the first place to start would be dealing with the giant smelly cat box that lives between the washer and dryer. I want one of the litterboxes that washes/cleans itself. Then paint, better shelving, better organized storage, and a husband that puts things away back where they belong would be a great start! I'm inspired to use wallpaper in my laundry closet! It's the only place I think I could experiment with it! Awesome giveaway! I would love to put better lighting in my laundry room. It's in the basement and has very low light down there! 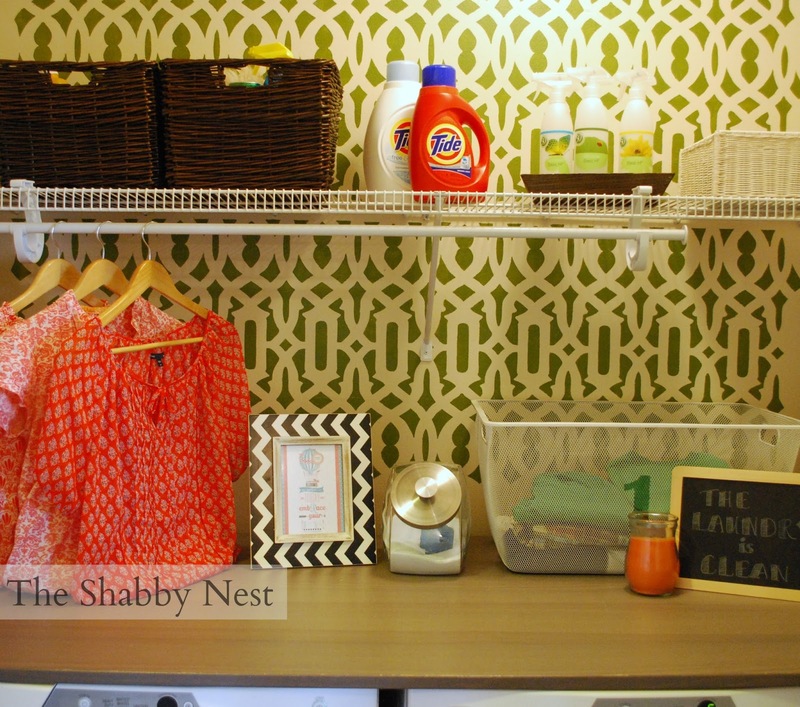 I would love to fancy up my dreary laundry room with perhaps a cute folding table and some fun wallpaper! I would repaint the room and add storage for starters! I'd love to build pedestals for my washer and dryer, and add a counter on top of them. We also need more storage. I would love to install a counter over the washer/dryer and do something to conceal the water heater. Paint and replace the wire shelves! i would love to start with a shiny new laundry sink! our area is in an unfinished basement and the sink is so gross that i don't use it! We are moving into a new house next week and I'd love to add some hanging rods and shelving to my new laundry room!! I would like more shelving, labeled bins and pictures to hang on my wall. Would love to add cabinets in lieu of the open shelving where all of my mess is constantly on display! We're working on the laundry room right now! Fresh coat of paint on the walls, trim around the doors, new curtain, new light fixture, and hopefully a cute mudroom shelf! Oh goodness, where do I begin! Paint, storage, shelving, cabinets...I could use it all! I love what you've done with your laundry...I might have to copy a few ideas! P.S. Wondering if I might borrow those lovely blouses hanging in your new laundry room too! we desperately need a new washer and dryer! we bought ours used 5 years ago.. and they were already old then! the dryer stays on when you open it haha. it's amusing chasing our clothes around the dryer if we don't turn it off first, but it would be nice to replace them! I love this - it looks amazing!! I definitely need to spruce up my laundry room. Id like to do a cool paint design like stripes and add in some shelving units! I'd love some built ins and new (non laminate!) flooring. It would transform my laundry chore! I would love to add a counter on top of my washer and dryer!! Awesome laundry room! I am dying to spruce up my laundry room! I've bought paint, but I need to do some work on shelving first. I want it to have peacock blue walls with white and chrome shelving (the washer and dryer are white). First, I'd like to actually have a laundry ROOM. We just have a laundry closet. I'd love an area to be able to fold clothes. On my to do list is to first paint the laundry room and make a folding table! I would love to add some "hanging" storage for drip dry items...and/or items that come out of the dryer. THANKS for the opportunity to win! What a kind giveaway. My laundry room is in the basement and it not nice at all, in fact I hate to have people see it at all. I might just enter that other contest as well, although I'm not sure they can do much. I have been admiring your laundry room for quite some time, love the stencil. Oh how my little laundry room needs a "spruce!" I'd love to create an accent wall with wallpaper, add some shelving, install a drying rack and hang a little chandy...because if i'm going to be doing laundry, the space better be cute! Hope I win! Some great ideas here and I certainly need them! My laundry room is a snoozer. I think I would do 2 things to jazz it up a bit. Wallpaper would make a huge difference and cabinets above my washer and dryer would be a dream. Thanks for posting...I so enjoy your blog. I would definitely add some paint and pretty storage! I'd like to do a total makeover of our laundry room! It's a really tiny space, so I want to lighten it up and bring in more storage. I would like to add more cabinets and wall shelves, love the idea of decoupaging the inside of cabinets. I'd love to find a cute little light fixture... maybe something retro, or maybe a baby chandelier. I'd like to add some accent colors and maybe some vintage laundry decor. That would be really nice!! My laundry room is in the basement so I would love to have a new area rug for the space, shelves, and a new table where I can do my folding of the laundry. My laundry room is also in my basement. Girlfriend needs a whole new makeover! I'd like to add a counter top or some area to fold. Also, I'd like something to organize by color because I always have a huge pile and it takes 15 minutes or more just to sort! Just moved into an older home owned by 100 year old aunt. Who pasted away As you can imagine the laundry area is in much need of a make over. Just a section with an ancient washer and dryer and old cement floor. No shelves , folding or hanging area. It needs much help. Would love to fix it up . I would love to add a sink to my laundry room - it would be such a great addition. I'd love a place to hang clothes. I would like to add living quarters for a live in laundress ;-). Our laundry room is in the basement. With 5 kids and a chimney business those machines run all day long! Realistically though - a new paint job and some non-gorilla rack storage would be peachy. My laundry "room" is best defined as a laundry closet! I would paint it some fun color and re-organize it to be more functional. I would add more storage over my existing bottom cabinets which were actually put in to use as a sewing area in my long laundry room, but this turned out not to be a functional spot for sewing, so I would definitely change the area. I would also love to change the countertops. We are moving in the next couple of months and I want to fancy up the new laundry room! I would definitely add more storage space. I also would like to decorate it and spruce it up, and make it cute and fun to be in! I would like to add shelves over top my washing machine, update my clothes hamper and paint the walls apple green! I'd definitely put up shelves for some organization and buy knobs for the cabinetry. I'd love to get a piece of wood for above the washer/dryer so that I can finally fold clothes in there instead of the bedroom! I'd also love hooks to hang up the ironing board/iron. I would love to replace my old sink with something nicer and more functional and add some stylish storage and clothes sorting solutions! I'd like to paint the entire room, add shelving, and replace the utility sink. I'd love to add some color with some paint (LOVE your stencil) and some cute storage baskets. I have been wanting a front loader set FOR.EVAH. My old top loaders just.won't.die. I love how neat and clean laundry room makeovers appear...I do agree though that a laundry room needs to be functional. I would like to make over my laundry room so it is not a catch all. Our laundry room is attached to our bathroom (you go through the bathroom into it - separate but connected) so it is always a catchall space. I would build some homemade shelves and repaper or paint the walls. my laundry room is the only unfinished part of our basement. luckily, we are starting to drywall and tile it so it looks less dated and yucky. thanks! totally inspired by the big, bold prints seen in laundry rooms lately, either by wallpaper or stencil - i'd love to go that route in our laundry room! plus a new washer and/or dryer would be fabulous! I'd install beautiful shelves, storage baskets and rods for hangers -- to make doing laundry a more peaceful experience! I would love to add a counter over the washer dryer. Way cute laundry room! I am doing a new laundry room...moving mine upstairs. I would love a folding table, and Way cute wallpaper too! I would love to add some open shelving and a countertop across the top of my washer and dryer! We just added a shelf above our washer and dryer, but I love the clothes hanger, that would be a nice addition to our laundry room. I would like to add a folder area and cabinets for storage. First I would add a wall and a pocket door to my laundry area that is currently in the garage. Then I would paint snd paper with citrine snd gray to complement my washer and dryer. Finally I would add a bright rug and some open shelves. That should run about $500.00. Thanks for the opportunity. I would add a cabinet with a shelf for storing and folding. A beautiful 5 x 7 rug. Fresh paint on the walls. Then a folding wooden laundry hanger or the wall. Ohh, there's too much to list. We don't even have a proper laundry room, just an unfinished basement with laundry hookups. Blah. Wish me luck! I would build a wall to separate my laundry room from our schoolroom. I homeschool my five kids and the two spaces are in the same room right now, which means I can't ever do laundry until the school day is over because it is too loud! Arghh! I would also build a cabinet around the water heater next to my dryer and put a cute rug on the floor. With five kiddos, I am always doing laundry! Love your stencil and color in the laundry room, would love to add some color and additional storage to mine! My laundry room is tiny so I would create some additional storage, add new lighting and paint! I'd really just like to paint my laundry room. That would be a huge improvement. I don't even have a laundry room, I have a laundry closet! So I would expand it into a real laundry room! My laundry room is also my pantry and I"d love some better organization for the staples in there. My laundry is in the basement, so I'm somewhat limited but a folding area would be wonderful!! 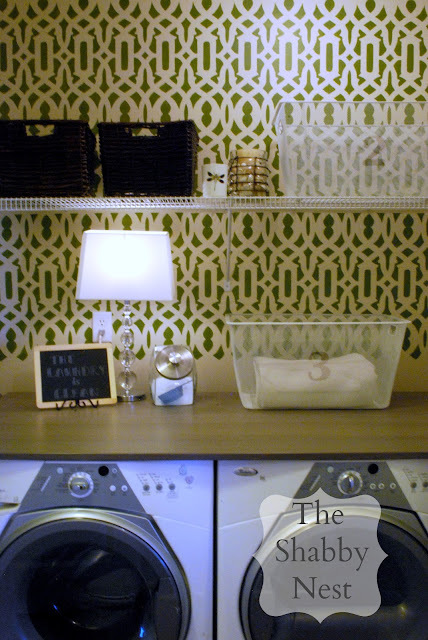 LOVE your laundry room - that stencilled wall is just fabulous!!! I would replace the sink & counter top that's in our laundry/mud room...and hopefully be able to throw a folding station in there too! I'd love to change up the laundry sink and also find a way to better store laundry baskets. Thanks for the giveaway! i would love to completely re do the laundry room in my cookie cutter house. I want it to be a room that is not just a pass through but somewhere i do not mind being. What WOULDN'T I do? Our laundry room is disgusting, but boy oh boy, I bet $500 could go a long way in changing that! I would paint the cabinets and walls and add a window! Our laundry area is in the basement-- I'd like to paint the cinder block and hang some new lights to brighten it up over there. A rug to keep my feet off of the concrete floor and some shelves and a hanging area would be awesome. I would love to add a table for some folding and sorting space and also maybe add a little paint, wallpaper or decor, right now my laundry room is very white! Oh man...my dryer just broke! I need a new one like, yesterday. I would love to add some shelves and paint the cabinets that are in there! I'm actually right in the middle of sprucing up my laundry room. So far I've added board and batten with hooks, some art, new cabinets instead of the wire shelf, some handmade shelves. I still need to make a pretty skirt for my utility sink, paint the door, and make a few more small improvements and I think I'll be done! 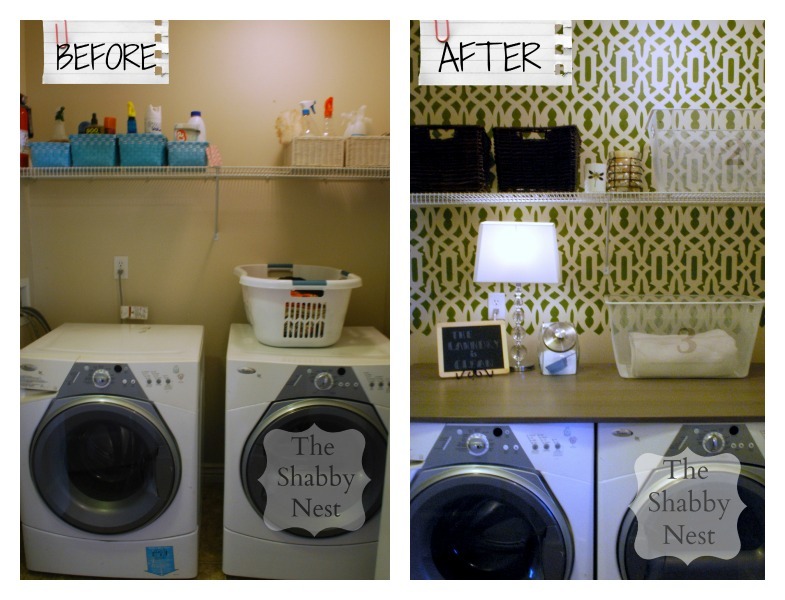 Your laundry room looks AMAZING!! I love it! I need a total makeover in my laundry room, but for sure the walls need painted, maybe a stencil! Thanks for the giveaway! Ahhhhh-mazing!!! I'm so excited I stumbled across your sweet blog! In about 4 weeks we're expecting our third little one... our third under two-and-a-half :))) I'm gonna need more baskets!!! I would love to have more storage! My laundry room is a boring closet. It needs paint and shelves that I can reach. Some organization is needed to clear out the clutter. I would love to make it FUNctional so that it's not just a boring builder white/blah closet in the hall bath but somewhere I can smile when I spend time. This gift card would EASILY help me brighten this space and add some shelving and storage along with color. I'd love to get a fresh coat of paint in a bright color to make laundry time more fun! I would love to jazz up my laundry nook by adding a cute corner for hanging up the clothes I can't dry and a new coat of paint wouldn't hurt either! I basically just have a laundry closet. I would love to somehow make it seem like it has more space. And, it needs a new light fixture. I would start with fresh paint and then add some shelving, cabinet tops for folding/storage of laundry baskets. Technically I don't have laundry room,just a laundry closet. But I would love to add additional shelving above my washer and dryer. I would love to finish my laundry room!! We started redoing it about a year ago and it still isn't finished. More storage is always a must...and a place to hang dry clothes would be nice. I'd really love to get rid of the awful texture on the walls in my laundry room, but I'll probably just settle for a bright paint color. I have a bunch of raw wood shelving in there that I'd love to paint white and add molding to for a nice finished look. I am blessed with a brand new home with a laundry room upstairs but it is completely bare. I'd love to add shelves and paint the walls! What couldn't I use in my laundry room! Seriously, any of your tips would be an upgrade, but mostly just some organization to start. Love the Wall pattern! I'm not sure where I would start since my laundry room is in the garage, but it would probably include some new storage options. I'm lucky to have a huge laundry room but it has no color. It's all neutral. I really like the stencil wall you did behind the washer and dryer. I may would do something similar to add color and go from there. I would love a counter top to fold my clothes on. I would love a front load washer and dryer to free up space above them! I love the idea of a counter top as well! I have a laundry closet, not a room. Id like to put in some over head shelves and organizers and Id like to hang a sliding door or nice curtain type fabric to hide it when needed. Our laundry "room" is in the unfinished area of the basement... I would love to get some drywall up in there and make it prettier... it would also be nice if my handy hubby could build some sliding barn style doors to separate the space from the rest of the "room". I need to do something about the 1980s linoleum and the bunny wallpaper. This is the last room to get de80ied and brought into this century. I want to add a counter over the appliances, and get better shelving. I would love to get some lilac paint and give it a freshy, happy look. The wallpaper made all the difference in the world. Wow! My laundry room is a complete embaressment. I have the oldest ugliset filing cabniet in there that my husband refuses to get rid of. It needs HELP!!!!! I'd love to add some color to the walls and might use that room as a test for wall paper. :) I also want some cute shelves above the w/d. Wow! What a great giveaway! We just moved into our home originally a caretaker's cottage after a year of renovating. We would LOVE to win this! We are done renovating and into decorating. I have not done one single thing to the new laundry. Plain white & boring! I would love to add some storage, maybe some cabinets and shelving storage. i'd really like to add shelving and a new light fixture! I would definitely add some counter space to work on! I would like to paint, add wall décor (there is currently none), change out the light fixture, add a rod for hanging clothes, a rug and possibly some open wood cabinets or shelving! I would love to add some color to my laundry room and do a fun stripe with paint. I would also like to add in some shelving or storage units and add some cute decorative touches! Would love a sink and more folding space in my laundry. And a chandelier. :). i'd get rid of my ugly fluorescent lighting! I would like an awesome paint color and better storage for all of the junk that ends up in my laundry room. I have more of a laundry closet....so I would LOVE to pick out a fun color for the inside and definitely get some more shelves and baskets! I would love to be able to make over the laundry. It is a miserable place to work! Storage, color, functionality. I can use help in any of these areas! Oh there's so much I want to do to our laundry room. A new washer, a new dryer, better lighting, better shelving. I could really use some help! I need to put a countertop over my washer and dryer. Right now our laundry room consists of cement floor and sheet rock. Nothing pretty about it. I would love to get some flooring in, create shelving and a folding area. This gift are would be a great help in us starting this big project. I think painting would be a good start to helping my laundry room. It's a hideous brown right now. I have wire shelving in my closet laundry room and need to add pretty storage options to make it look more organized. Love what you did to spruce your space up. I'd love to paint and add an area to fold clothes! I would love to wallpaper and add shelving!! You are my inspiration! My laundry room is in my garage and is screaming for a makeover! Thanks for the chance. Washer, dryer, & decorating > Oh me Oh my I'm jumping for joy. After 17 years with the same stuff I would be over the moon happy to get a facelift to my laundry room. 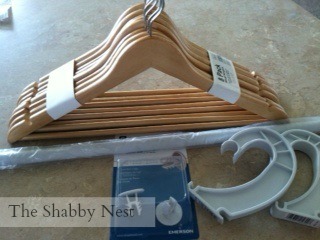 Thanks Shabby Nest for this chance to improve the look, smell, & my attitude when I do laundry next time. I'd like to change out my lighting, from a measly contractor grade light to recessed. I think $500 would cover it! I would love some cabinets above my washer and dryer and a table top for folding laundry! Our laundry room is a complete mess right now because we just moved! I would paint, hang some nice curtains, put in a table for folding clothes and some nicer shelving. New flooring & some shelves would be nice. I would love to get a better system for sorting and storage. Thanks so much for a great giveaway! This would be great to help create more storage! My laundry room desperately needs cabinetry, open shelving and artwork to jazz it up a bit! Organization! and a place to fold clothes.